It's time for another review of a Master Books title. Have you seen their new website? It is so much more intuitive! Today, I'm reviewing The New Weather Book, part of the Wonders of Creation series. I already own the original edition of this book, but no matter how many times I've tried, I just could not actually work through it with my children. I know, that isn't a ringing endorsement, is it? The thing is, I've been reviewing pretty much all of the new titles in this series though, and those I simply love. They are easy to use, images are better, the text is better organized, and they just are something we can actually use as schoolwork, instead of only using as a reference. Calama, Chile in the Atacama Desert is one of the driest places on Earth and didn't have a drop of rain from 1570 until 1971. That’s over 400 years without rain! 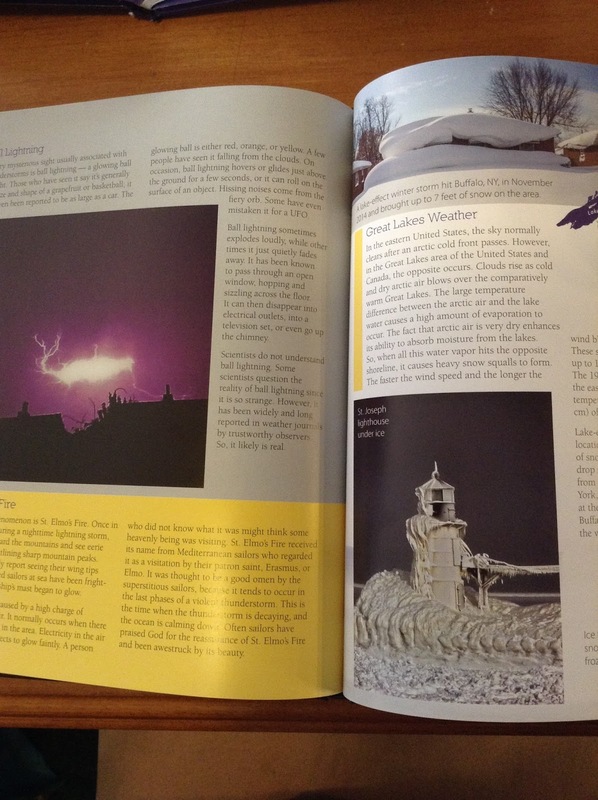 Learn the classifications of clouds, what causes ball lightning, the life cycle of thunderstorms, and amazing weather facts! This book is fabulous. As I've stated in my reviews of The Ecology Book, The New Astronomy Book, and The Mineral Book, the absolute coolest thing is that the book is color-coded for different age groups. 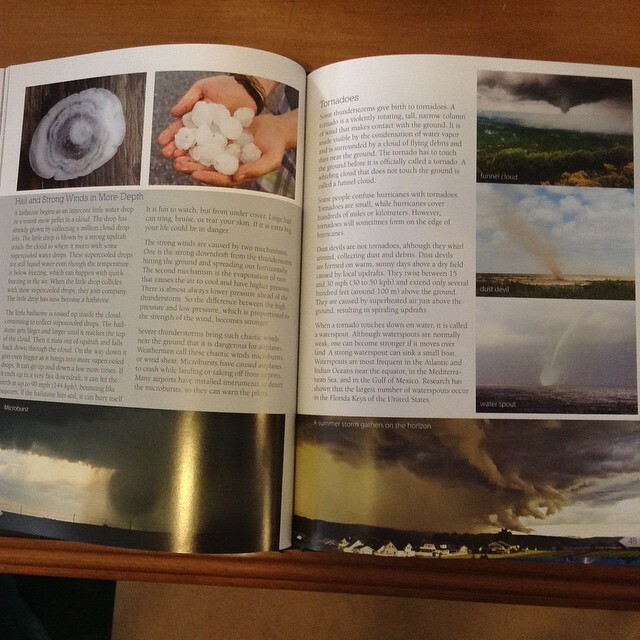 In The New Weather Book, the most basic information is on a white background. This is for everyone, and we've been reading that aloud with all the kids (ages 9-18). In the photo below, the white background is the entire right page that talks about the weather of the Great Lakes area. For the middle levels, you would also read the yellow background areas. 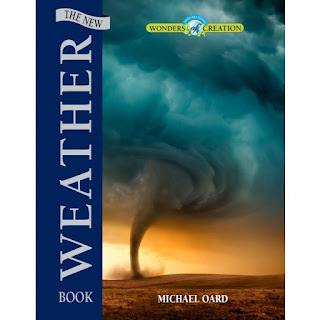 This tends to cover more detail on weather and climate, and this is where weather vocabulary is covered. In the photo above, the yellow section is talking about St. Elmo's Fire, which is fascinating. I also read this aloud to everyone, as we do enough science around here that my kids are generally ready for a bit more detail. The most advanced material, which I think is good for at least upper middle school and above, has a gray background. The idea is that these areas are getting into more complex theories, and the taste of the topic should give advanced students ideas for research. I allow Richard and Trina (ages 11 and 9) to leave, if they aren't interested. Most of the time they stick around. The page above is talking about ball lightning. That certainly keeps the attention of my younger ones. This photo is of a section that is of particular interest to us. Tornadoes. Yeah. 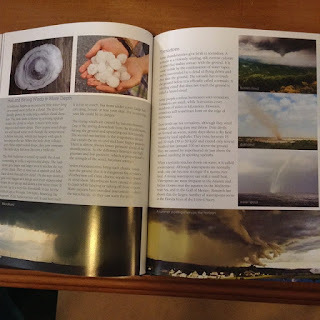 There was a tornado warning here today (just barely north of us, actually) and you better believe all of my kids were attentive for this section. I think the book is probably best for approximately grades 4 and up. If you are doing it with a high school student, Master Books will be coming out with a Parent Lesson Plan (it's pictured in the book but not yet on the website) that pairs this book with The New Astronomy Book for a 1/2 credit course. I will continue to collect every new book that comes out. I love these. And right now, if you are reading this, I'd love for you to go visit Master Books and tell me in the comments here what book or set you'd love to see me review. I'll see if I can pull that off! Disclaimer: I received this book for free from New Leaf Publishing Group. No other compensation was received. The fact that I received complimentary products does not guarantee a favorable review.